New for Summer 2013...Spring Butterflies features a lighthearted design of lime green butterflies and black flowers on a white background. 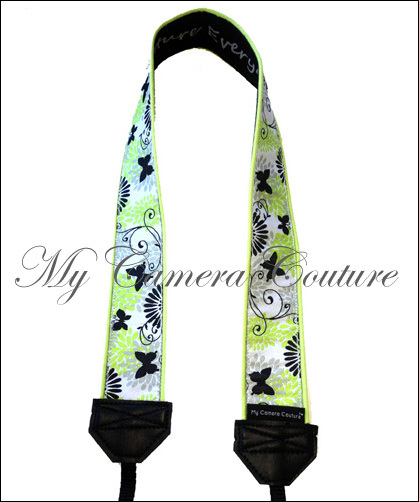 This design is backed with our own "Capture Everyday Life" material and lined with lime green. Choose either our standard or quick release attachment straps, which are are 3/8" wide, suitable for all SLR and DSLR cameras and many compact cameras too. Either way, the total length (with attachment hardware) is approximately 44".